A Lamborghini here, a Lamborghini there, sooner or later it starts to add up. A former pastor at the megachurch founded by “prosperity gospel” superstar Joel Osteen is having a hard time defending his purchase of a $200,000 Lamborghini for his wife Aventer Gray, to celebrate their anniversary. At Lakewood Church, pastor Joel Osteen proclaims, "It's God's will for you to live in prosperity instead of poverty." Osteen, who lives in a $10.5 million mansion in River Oaks, practices what he preaches. Apparently. so does his former associate pastor, John Gray. While the traditional theme for an eight-year wedding anniversary present is pottery, on Sunday, Gray took it to a whole new level, gifting his wife, Aventer Gray, a $200,000 Lamborghini Urus. 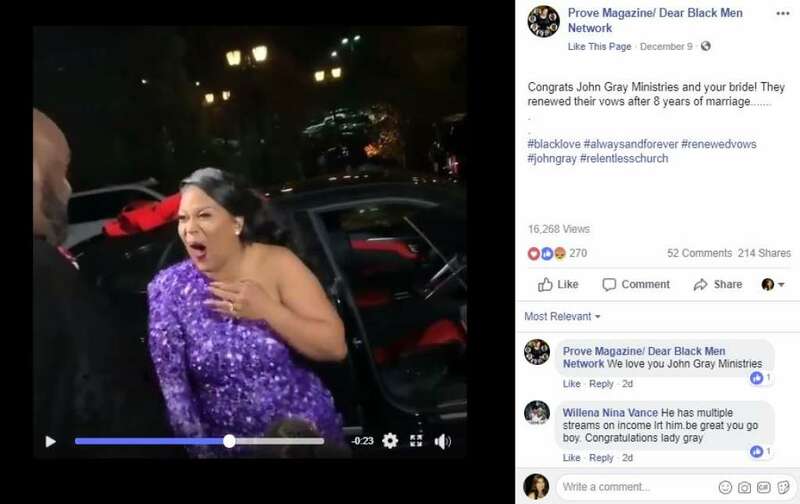 Mr. and Mrs. Gray were roasted on social media after they posted boast videos about the ultra-luxury Lamborghini Urus, which travels zero-to-62-mph in 3.6 seconds. The good pastor posted a video to Instagram capturing the the moment he handed The Missus keys to the bow-wrapped SUV. Aventer Gray posted this defense of her husband's purchase of new car on Instagram, and it's full of silliness. MY HUBBY IS A HARD-WORKER, HE WORKED HIS WHOLE LIFE AND HE SAVED TO BLESS HIS WIFE!!! REALJOHNGRAY AUTHOR X 2 SILENT ENDORSEMENTS (YOU KNOW BECAUSE EVERYONE DOESN’T HAVE TO BRAG ABOUT WHO THEY ARE SIGNED TO) 6 TV SHOWS MOVIE PRODUCER SONG WRITER TOURS Gives away cars, full houses of furniture, coats off his back... Checks before pastoring and tithes that in its entirety between 2 churches AND those he feels lead to at any given moment... BEEN WORKING FOR YEARS...GET OUTTA HERE WILL👏🏽STAY 👏🏽OFF 👏🏽MY 👏🏽HUSBAND... I don’t see anyone screaming about how basketball players drive what they do while you paying $$$ to see them play in arenas and on fields...🙄 We don’t live for people! We live for God! Back to my regularly scheduled grocery store trip!!! Happy Sunday! Gray is currently the pastor of Relentless Church, and insists he didn't purchase the vehicle with church money. "God helped me to make my wife's dream come true," Gray said in an Instagram post on Tuesday. "Why not? She's made mine come true!" In a Facebook Live video Thursday, the pastor said "not a nickel, not a penny" of church money went into the car purchase. "First of all, it wasn't a pastor that bought the car. It was a husband that bought the car," said Gray in the Facebook Live stream. "I'm a husband first. Don't confuse what I do with who I am. What I do is I pastor God's people. Who I am is a husband and a father and I'll do anything to honor them. And I won't ask permission from anybody to do it." "My wife has pushed for my dreams and my vision, and she has toiled with a man who is still trying to find himself," Gray went on, and on, as someone who's done nothing wrong tends to do. "That carries a weight. I wanted to honor her for how she’s covered me." Okay then! Guess that settles it.